This post is sponsored by Edge Homes. You know how I love a good reveal! 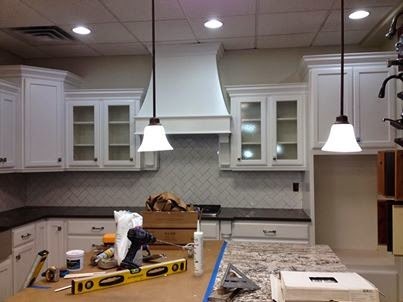 Well, on Thursday we're going to be revealing the new Design Center kitchen at the Edge Homes offices. I'm sooo excited! For any Utah locals who'd like to come see it in person (and really, if you like kitchens you'll LOVE it) we're holding a ribbon cutting ceremony/open house Thursday, March 27 at 4 pm. The Edge Homes offices are located at 480 West 800 North Suite 200 in Orem. There will be refreshments - rumor has it cupcakes will be served - as well as a special treat for the first 50 guests. Seriously, Edge shindigs are a lot of fun, so if you live close by, come on in! Getting closer, but there's still more awesomeness to come! All photos courtesy of Edge Homes. I was compensated by Edge Homes for this post, but my opinions are 100% my own. I love Edge! Seriously.